It’s that time of year again. Springtime at Vail Mountain is soon upon us. Along with the bluebird days, warm temperatures, spectacular spring skiing and snowboarding, comes the biggest end-of-season bash in the Rocky Mountains, Spring Back to Vail, April 8-10. The season will end in style with some not-so-serious fun under the sun, including a free live concert, the infamous World Pond Skimming Championships, après after-dark parties, base area giveaways, and much more. On Friday, April 8, Chris Robinson Brotherhood will kick off Vail’s closing weekend and Spring Back to Vail celebration in Vail Village with a free concert presented by Town of Vail. The venue will open at 5:00 p.m. with music starting at 5:30 p.m. The Chris Robinson Brotherhood, a psychedelic rock n’ roll band from California, is celebrating its latest release, Phosphorescent Harvest. 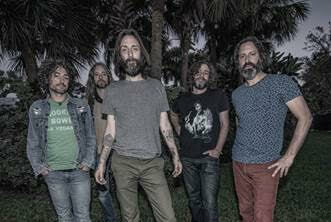 The CRB debuted in early 2011 and released their first two studio albums in 2012: Big Moon Ritual (June 2012) and The Magic Door (September 2012). The band members include, Robinson (Lead vocals, guitar), Neal Casal (guitar, vocals), Adam Macdougall (keys, vocals), Mark Dutton (bass, vocals) and Tony Leone (drums). Friday’s Spring Back to Vail concert is free of charge and will take place at Solaris on East Meadow Drive and Willow Bridge Road in Vail Village. Visit www.SpringBackToVail.com for more details. The schedule of activities for Spring Back to Vail 2016 will once again include the sponsor expo village at the base of Gondola One, April 9, and at the base of Golden Peak, April 10. The closing day tradition of donning costumes and skimming across icy water holds strong as participants will ski themselves off a snow jump in the hopes of coming out on the other side in the 14th Annual World Pond Skimming Championships on Sunday, April 10. The top male and female in the contest will each be awarded the grand prize of a 2016-2017 Vail Resorts Epic Pass and a pair of Liberty skis. The spectacle defies the laws of physics and common sense as a panel of highly-skilled judges scores each competitor on distance, style, creativity and water resistance. The contest gets underway at 3:00 p.m. and the Golden Peak venue opens at 1:30 p.m. for sponsor expos and giveaways. Registration details coming soon. Spring Back to Vail is presented by Vail Mountain, Town of Vail, Pepsi, Bud Light, Audi and Smith, and brought to you in part by Helly Hansen, Nature Valley, Liberty Skis, Vail Resorts Retail and Colorado Mountain Express.